The problem was that the judge declared that Crystal Cox is not a journalist. First amendment lawyers worried about the effects that decision might have on other bloggers, who might be journalists. Crystal Cox is not a journalist, but is an extortionist. Still, Marc worried about whether this decision could have unintended consequences. 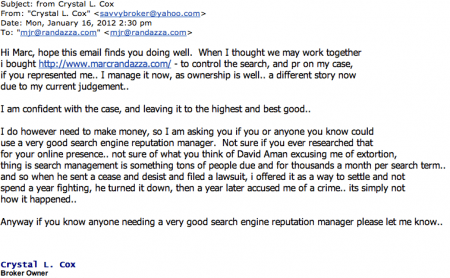 He briefly agreed to represent Crystal Cox, then she changed her mind, got angry with Marc, and decided to register a bunch of domain names using Marc Randazza’s name. Then she offered Randazza “reputation management services” (i.e. pay me a monthly fee, or else). When he did not agree to pay her, Cox began posting defamatory content about him on multiple websites. This isn’t the first time Cox has done this, and the rest of the world recognizes this as extortion. Crystal Cox didn’t only lash out at Marc Randazza. She lashed out at his wife and their three year old daughter. 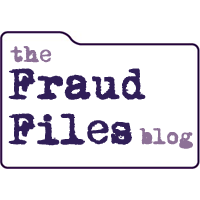 Randazza and his family took Cox to court, alleging cyberpiracy and cybersquatting, among other things. In the meantime, a list of domain names containing Marc Randazza’s name and registered by Crystal Cox were turned over to Marc Randazza pursuant to an arbitration decision by the World Intellectual Property Organization (WIPO). The WIPO decision stated that the domain names were registered and used in bad faith by Cox, who was attempting to extort Randazza and confuse consumers. 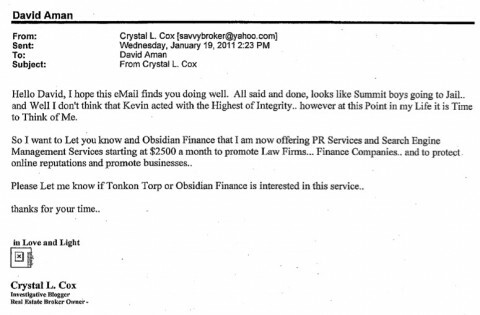 Crystal Cox is currently being represented in her appeal of the Obsidian case by Eugene Volokh. I understand that he’s worried about how this “not a journalist” decision might affect other real journalists who write primarily on blogs. But I wonder why he hasn’t learned anything from the Marc Randazza debacle. No good deed goes unpunished. How long until Crystal Cox gets mad at Eugene Volokh and starts defaming and extorting him? Nothing is too crazy for Crystal Cox, who now thinks she’s uncovered a massive conspiracy tying together dozens of people. Apparently these dozens of people all have some sort of mythical connection that makes them want to murder Crystal Cox. Or something like that.